The Schaurer Foundation gift helped purchase oxygen masks like the one pictured, which helped resuscitate a calf following a barn fire in Liberty Township. DARKE COUNTY — Local nonprofit Darke County Friends of the Shelter recently received a $1,500 donation from the Lydia Schauer Memorial Trust Fund. According to the group’s secretary and treasurer, Bob Harshbarger, the funds were used to purchase cooling vests for local K-9 officers and animal-friendly oxygen masks. Harshbarger expressed gratitude to the woman who gave the Schauer Fund its name. “She loved animals, and that’s been a big help to us,” Harshbarger said. Part of the Friends of the Shelter’s mission, according to Harshbarger, is to fill in the blanks and provide comforts that city and county budgets aren’t able to account for. The Schauer donation allowed the Friends to purchase cooling vests for local K-9 officers working with the Darke County Sheriff’s Department and Union City Police Department, Harshbarger said. The animals wear bulletproof vests that can cause them to overheat when riding around in police cruisers, according to Harshbarger, and the cooling vests can help mitigate that. The gift also helped cover the cost of donating 22 Fur Life Pet Oxygen Mask Kits to 10 EMS and 12 fire departments in Darke County, Harshbarger said. Each kit includes three oxygen masks of differing sizes, oxygen tubing, a leash and a laminated instruction sheet. “We went to all the fire stations and said that if they would use them, we’d like to consider donating,” Harshbarger said. 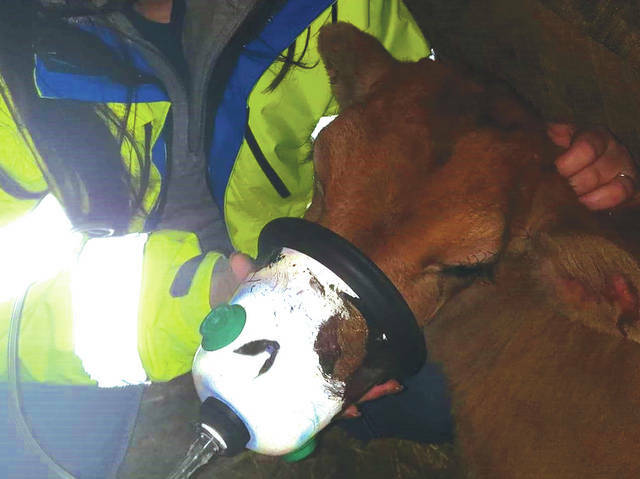 One of the kits was recently used to resuscitate a calf who’d inhaled smoke during a barn fire in Liberty Township, according to Harshbarger. Other recent projects include the installation of special acoustic panels in the kennel area of the Darke County Animal Shelter. Harshbarger’s group also helped build a 3-acre dog park near the animal shelter, a project for which it has received a fair amount of recognition. Unlike some of the group’s projects, however, the park is an ongoing effort. Those funds come from the group’s yearly fundraisers, according to Harshbarger. In addition to private donations from local individuals, businesses and charities such as the Lydia Schauer Fund, the Friends hold a number of events each year. In just two weeks, Harshbarger said, they’ll hold their biggest fundraiser, the annual Scentral Park 5K Walk/Run, which will take place at the Darke County Fairgrounds the weekend of April 20. Participants can sign up the day of the event and are encouraged to bring their pets along for the ride, Harshbarger said. “All the proceeds go to the care of the dog park,” Harshbarger said. Though the group’s efforts initially focused on the Darke County Animal Shelter, Harshbarger said, it has expanded its focus in recent years. The group continues to be dedicated to helping Darke County’s more furry residents, however. This entry was tagged animals, Darke County Animal Shelter, Darke County Friends of the Shelter, Darke County Sheriff’s Department, Darke County Sheriff’s Office, donation, Fur Life Pet Oxygen Mask Kit, K-9, Lydia Schauer Memorial Trust Fund, Nonprofit, Union City Police Department. Bookmark the permalink.